SmuttyCat has just watched the newest trailer for Iron Man 3 and can only say; MWOW!!! The action, drama and effects are all just what we have come to expect from the great Marvel Movie Machine and more. The glimpse of Tony and Rhodey reaffirms the snappy banter of previous IM movies. But the best yet is (spoiler alert! ); an army of remote controlled armor for back up! Whoo hoo! SmuttyCat is dancing on his hind paws in anticipation. CGI doesn’t get any better than this, and everyone knows SmuttyCat has a thing for robots. So now, when can SmuttyCat get his hands on an army of remote Iron Man armors? 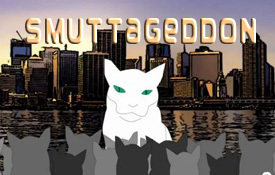 Anyone have a hook up, cause this would really be helpful in SmuttyCat’s plan to take over the world.